As a teenager I loved fiction which mixed real historical interest with the gentlest sort of hint at romance. My favourite writers were Hester Burton and KM Peyton. So I was pretty sure that I was in for a treat with Sheena Wilkinson's latest novel, Start by Star. And I was right. This story is set in Ireland at the close of the First World War, with the 'Spanish' flu pandemic killing even more than that terrible war had, with physically and mentally wounded young men returning from the front, and all whilst the question of Home Rule for Ireland is very much in the air, and (some) women were able to vote for the first time. 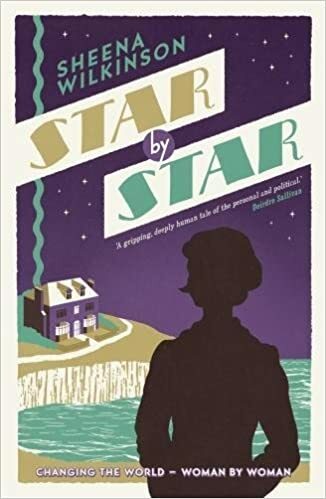 Stella tells her story, coming to stay in Ireland with an unknown aunt after her mother dies of the flu, sharing a boarding house with a mix of characters who have different life experiences and outlooks, fighting to be recognised as more than 'just a girl', and also finding a possible worthwhile future for herself. Stella tells her story in quite a modern voice, immediately relatable to today's child readers. She's a determined, but vulnerable, character who we immediately care for. She observes her time and place and self with insight and humour. I loved it when, for example, 'Mrs Phillips's mouth went cats-bottomy', or when Stella herself felt 'large and shy'. We know exactly what the first one looks like and the second one feels like. It's a hundred years since women were given some voting rights in our national democracy, and that disparity of treatment, and the fight that won something coming closer to equality, must not be forgotten. Every secondary school library should have a copy of this book to help the next generation value the say they will come to have in how their country is run. And because its a very good story, well told. What a lovely review of what sounds like a lovely book! And just in time to go on my Christmas list. Thank you, Pippa. On my Christmas list too! Sounds like the sort of book all young people should be encouraged to read.